The King is one of my favourite authors actually, but if there is one thing that annoys me about his books, it’s that he often struggles with the endings. Bag of Bones was no exception! Thanks for your comment, Michael. I have heard that criticism about King. However, the ending in Bag of Bones didn’t seem awkward or out of place to me. I will admit it was a little longer than it needed to be. But, I didn’t think it took away from the story. I’ve never read a complete SK novel. I started The Dark Half several years ago but got to scared to finish. I’m not as squeamish as I used to be, so, I might give him another try. Have you ever read this book, On Writing? Great book. If you haven’t read it, you should give it a try. I will admit there are some squeamish parts in Bag of Bones. However, I felt more weird that scared…even though they were ghosts throughout the story. LOL! Also, I will admit there is strong language and he deals with racial issues in the novel as well. Like I wrote in my review….it felt like I was reading a literary novel more than a horror novel most of the time. I heard that On Writing was really good. I will have to check it out. Thanks for the recommendation. It’s Katharine from Lit Fiction Group. I’m so glad you enjoyed your first King novel. I’ve been a big fan of his from the beginning — despite all his faults. While you were reading Bag of Bones, I was reading his 11/22/63 in which someone went back in time to the Kennedy murder. It was, as they say, a great ride & I spent most of an entire day finishing it. It did not have a crummy ending — although I wonder what Michael (above) might think. I love a big huge complicated novel, and this one was. Let me know if you ever read it. Thanks for your comments. 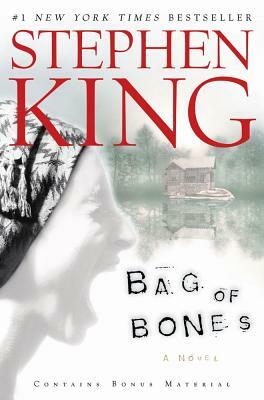 I did really enjoy Bag of Bones. Much better than I expected. I have not read 11/22/63. I haven’t decided what my next King novel. I’ve told that Dead Zone or Misery are the next King novels I should read. But we will see.